Dodger Stadium was built in 1962 and has been a beloved landmark in the City of Los Angeles. The goal of the Dodger Stadium Renovation project was to upgrade the venue and enhance the fan/player experience without losing the aspects that made the ballpark so iconic. The project included improvements to vehicle and pedestrian circulation, renovations and additions to restroom and concession facilities, two new LED scoreboards, a new video control and production facility, baseline advertising panels and new directional/informational signage. Raymond’s scope of work totaled 5.5 million dollars with a schedule of just over three months. 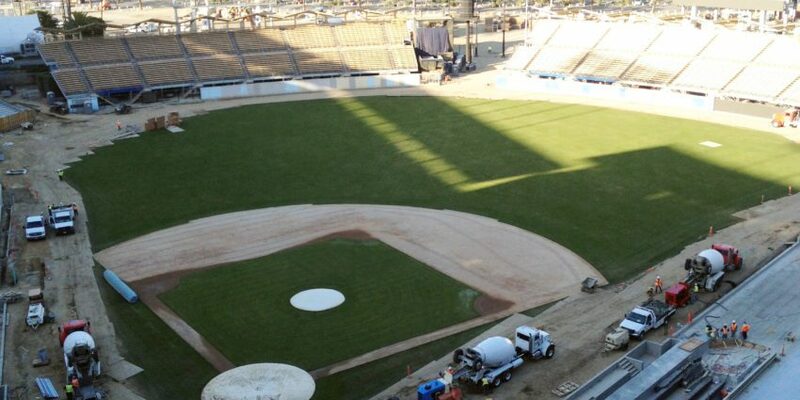 The Dodger Stadium Renovation project was awarded the 2013 Interior Commercial Renovation Project of the Year by the Western Wall and Ceiling Contractors Association (WWCCA).